In an era when African-Americans were told to sit in the back of the bus, Ray Harris Jr. drove the bus. 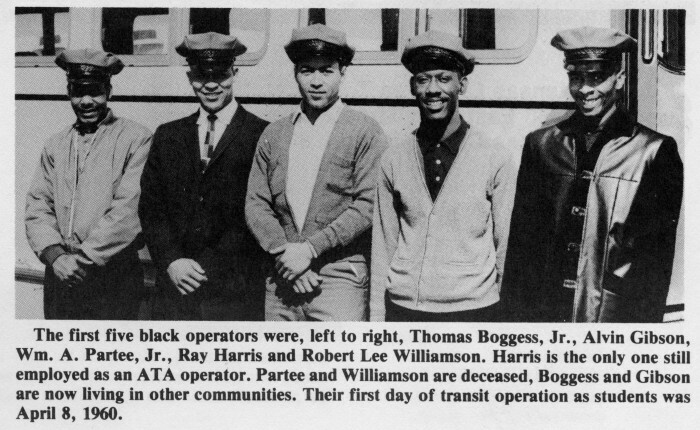 Four years after the U.S. Supreme Court struck down segregation on public transportation, Harris and four others broke the race barrier in Kansas City when they became the first African-American bus drivers for what was then known as the Kansas City Public Service Co.
Harris climbed behind the wheel of his first bus at the intersection of 48th Street and Prospect Avenue on May 3, 1960, his 35th birthday. Despite the Supreme Court ruling, it took Kansas City four years to hire its first African-American bus driver but only under pressure from local civil rights leaders and activists. Now 90, Harris remembers the difficulties of those early days. The first passenger he tried to pick up was a white woman. The greeting couldn’t have been any colder. “I opened up the door and she said, Oh, I’m not riding with a black operator,” Harris said. Harris brushed it off. He knew the woman was in for a long wait. After all, there were four more buses running behind him – all driven by African-American drivers. Harris is the last surviving member of that class of five African-American bus drivers who made civil rights history in Kansas City so long ago. Harris worked in public transportation for a little more than 30 years before retiring in June 1990. Not only was he among the first African-American bus drivers, he broke the color barrier in management when he came the agency’s first driving instructor. Two years ago, the KCATA recognized Harris’ part in the civil rights movement when it presented him with one of its first Rosa Parks Spirit Awards. The award was presented to someone who epitomized Park’s courage when she refused to give up her seat to a white passenger, setting off a chain of events that led to the historic Supreme Court case that integrated public transportation. KCATA employees came together on May 8 to honor Harris, who turned 90 on May 3. About 75 people, including Harris’ wife, son and daughter, turned out for a reception at the KCATA’s offices. Harris’ part in Kansas City civil rights history plays a role in shaping what the KCATA is today, Reardon said. “His courageousness, his willingness to serve as a driver to cut a path forward is instrumental in understanding what it means to being the organization that we are today and celebrate the diversity that makes ATA strong and makes us a good community servant,” Reardon said. Russell Collins, the new chair of the KCATA’s Black History Committee, presented Harris with a Metro bus stop sign emblazoned with the name and a “happy birthday greeting.” Collins also gave Harris a large blanket featuring an old photo with the first group of African-Americans to drive buses in Kansas City. Harris said he never dreamed of the possibility that so many people would gather to recognize his accomplishments when he took the city bus-driving job more than 55 years ago. A photo of the first five African American bus operators employed at Kansas City Public Service Co.
KCATA employees and retirees celebrate Ray Harris' 90th birthday and his service to the community.